The expansive new film, The Hobbit: An Unexpected Journey, brings audiences back to Peter Jackson’s Middle Earth. As the Lord of the Rings trilogy before it, the new film and its two sequels will follow nearly the same pattern: starting out on a long journey, delving into underground adventures, and returning a kingdom to a king. The big question is, will a single book broken into three parts be as compelling and exciting as a full trilogy of books with a movie devoted to each book? Has Peter Jackson strung this out further than it should be? To be sure, there is plenty in The Hobbit: An Unexpected Journey to be excited about. 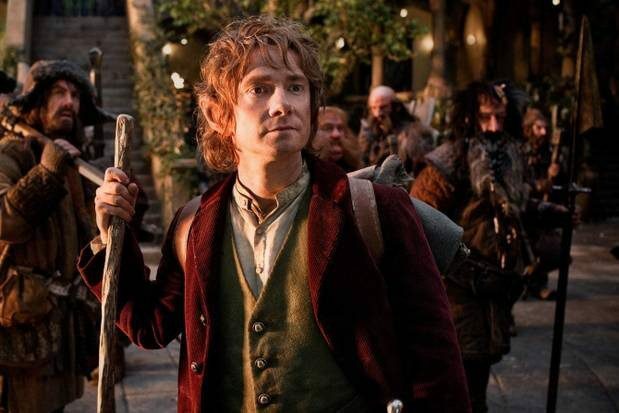 In the first film, Bilbo Baggins meets and sets off on an adventure with Gandalf and thirteen dwarves. There are twists and turns, but this movie is geared more towards a family audience than the Lord of the Ring films were. Will that blunt some of its appeal, or will the fan faithful return in equally big numbers to see it? Will the advanced film techniques and sharp 3D effects be enough to generate repeat audiences for the sequels as well? Many have clamored for The Hobbit to be made and the wonderful scenery and world of elves, dwarves, hobbits and orcs to be explored again. Peter Jackson is returning to hallowed ground and, according to the first reviews, the look of The Hobbit: An Unexpected Journey is excellent. There are some concerns that it might be a bit long in the tooth, however. As the story begins to plod a bit toward the end of this first film, it is salvaged by the highly anticipated appearance of Gollum in his first meeting with a Baggins. Unfortunately, as depicted in the book, this is Gollum’s only appearance. He won’t be in the second or third film. Can Peter Jackson keep the magic going without his star attraction? If he can make us care about the main characters enough, he may rescue the next two films from a slow box office reception. There are still many exciting parts of the story to be explored after this first movie ends. What isn’t apparent is if it is a full two additional movies worth of story that remains to tell. The Lord of the Rings trilogy felt right, the pacing apparent and fast. It was an exciting and well made set of movies, so much so that the final movie, Return of the King, won a best film Oscar. Even a successful launch of the first film in The Hobbit trilogy may not guarantee a repeat performance for the sequels. If the movie is visually brilliant, but the story is weakened out by being stretched over too long a period in an effort to draw the most money from the trilogy formula, this may be the last hit of the trilogy. The Hobbit: An Unexpected Journey is sure to be greeted with great fanfare as Peter Jackson did such a phenomenal job on his last visit to Middle Earth. The question is can he strike gold a fourth, fifth and sixth time. Are you looking forward to The Hobbit or do you think Peter Jackson should have left Middle Earth alone to be remembered fondly? Let me know in the comments below!